The anthology also features stories by David Clement-Davies (author of The Sight, Fell, and Fire Bringer) and two-time Hugo Award winner Catherynne M. Valente (author of the Fairyland series)! I’m super stoked to be in an anthology with them and can’t wait til my copy arrives so I can read “Fell’s Dream” and “The Wolves of Brooklyn”. 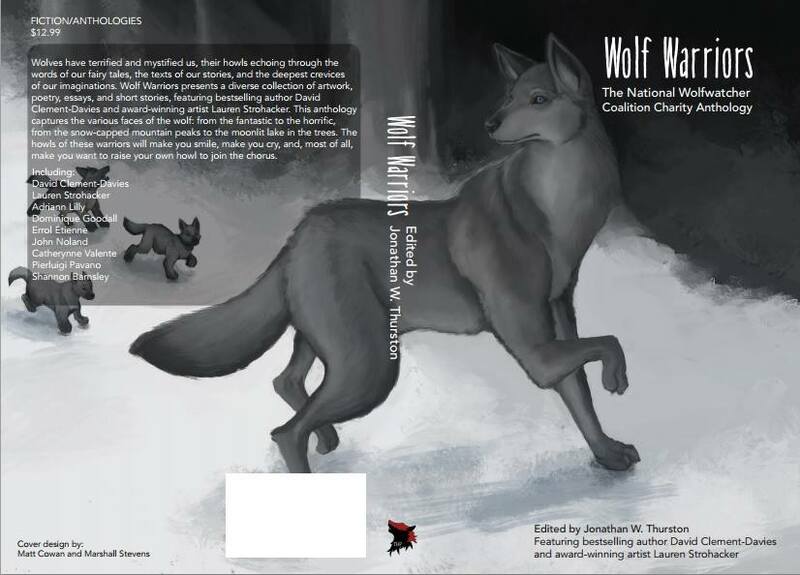 This entry was posted in My Writing, Writerly Things and tagged animals, anthology, art, books, Catherynne M. Valente, charity, David Clement-Davies, endangered species, fantasy, Fell, fiction, flashfiction, indie, indie books, indie publishing, Lauren Strohacker, National Wolfwatcher Coalition, nature, NWC, poetry, Shannon Barnsley, short fiction, werewolves, wildlife preservation, wolf, Wolf Warriors, Wolf Warriors: The National Wolfwatcher Coalition Anthology, wolves, writing. We interrupt your regularly scheduled programming to bring you shameless self-promotion. The anthology I’m in is out! Huzzah! Er, awwwoooooo? I loved your poem, “We Were Wolves”!